Avion trailers are among the most popular and widely admired vintage recreational vehicles. Tim Casteen, owner of a 1989 34' Avion shares his experiences and tips with LoveToKnow Camping readers. What led you to select - and stick with - an Avion travel trailer? I grew up camping with my family in tents from about the time I was three years old. 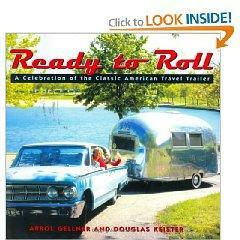 My dad had always loved, but could not afford, Airstream trailers. He ordered their sales brochures as far back as I could remember. His interest in aluminum riveted-construction trailers was contagious. Once I was grown and married, my wife and I camped in tents for several years. We "graduated" to a series of conventionally constructed trailers after several adventures with bears in Shenandoah National Park. I had always appreciated the Avion trailers due to the heavier frames, solid wood cabinetry, and foam insulation. We found a 1972 25' Avion in 1983, and it was love at first sight. In 1992, I spotted a 1983 30' Avion for sale in Linville, NC, and immediately made arrangements to buy that. (I sold my 25' Avion to a friend, who still owns it). Finally, in 2006, I found the Avion we had loved since it was first produced in 1987. It is a 34' with a rear queen-bed floor plan. I actually saw it on the Airstream owner's forum, as I had owned an Airstream motor home for a short while, and am a member of that group. I hadn't even sold the motor home, or the 30' Avion, when I bought the 34' model. Needless to say, we were financially strapped, but not for long. The Airstream motor home sold in just 13 days, and I ironically sold the 30' Avion to the man I had just bought the 34' from! Except for the difference in price, we essentially just swapped trailers! Avioners, like Airstreamers, are a very loyal group. By the way, my dad eventually got his wish. He bought a used 1972 Argosy 22' in 1979, and used it for 28 years before selling it to my daughter and her husband. 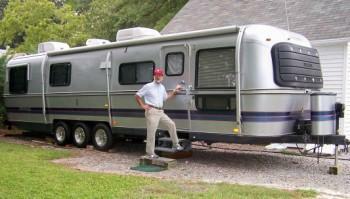 Airstream/Argosy owners are a loyal group also. There is lots of appreciation of construction quality in both groups. What do you see as the primary advantages of Avions over other types of travel trailers? There is no question that the all-aluminum riveted exterior and interior, along with a very heavy-duty frame, are the main advantages. There is also Avion's use of solid wood cabinetry throughout. In addition, they used standard trailer appliances, windows, plumbing fittings (except for residential faucets, sinks, etc. ), and such - so that replacement/repair is usually easy to locate and accomplish. To what do you attribute the continued popularity of Avions? First, the quality of the trailers is really not surpassed by any other brand. I know some Airstream folks would argue that point, but even my dad admitted that the Avion had an edge in construction quality - and he was a sheet metal worker all his life. There is also the continued association of a number of member groups which allows Avion owners to keep in touch, get together for rallies, and even for long planned trips together. The Avion Travelcade Club has been absorbed into the Fleetwood Club, but Avioners formed a club called Silver Avion Fellowship (SAF), under the leadership of Bob and Jewel Dee Muncy. What are the benefits of networking with other Avion owners? Are there any groups that you recommend? The benefits are the difference in having access to so many people who have been through whatever you need to know, enjoying getting together with people who have similar interests, and not being on your own with problems that may be easily solved by the advice available on Avion sites. There are many websites with places to ask questions and get help. Bob and Jewel Dee Muncy, along with and their son and daughter-in-law have kept the interest by keeping Avion owners in touch, informed, and by having get-togethers regularly. Their site is Vintage Silver Avions. Don Gradeless also runs several immensely helpful sites on construction, repairs, links, original price lists, manuals, etc. They are Avion Travelcade Club (Indiana Unit) and Fleetwood Travelcade Club (Indiana Unit). "Avion Guy" also has an excellent site with loads of information at Silver Avion. Last, but not least of the sites, is Tin Can Tourists, run by Forest and Terry Bone. They have revived a group that existed nearly a hundred years ago, and it is all-inclusive in membership. They have welcomed the orphaned Avioners warmly. This list is certainly not exhaustive, and I'm sure I've left out several excellent sites, but it does give the scope of possibilities for Avion owners. The last one I have to mention is a forum for Avion owners and those interested in Avions. It is Avion Camping and Restoration. What advice do you have for camping enthusiasts who are considering purchasing an Avion? Check all the sites I've listed. Most have a "For Sale" section, or links to sites that have Avions on sale. Some folks have had good success on eBay. One can even go on Dr. G's site and post what you are looking for. Maintenance advice is far too comprehensive to cover in a short writing, but the sites mentioned are excellent, and the forum site can pretty much help with anything. As with most things, if one is considering an Avion purchase, the range of condition runs from virtually new to needing complete restoration. So much depends on one's interests. I personally like to get good solid trailers, but I don't worry about routine wear and tear. I can improve the trailer back to almost original with some hard work and money. Avions, by design, tow extremely easily. Anyone who knows hitches and sway control products can easily switch to an Avion with no trouble. Since so much of safe towing is in the hitch and sway setup, I would advise anyone new to trailer towing to get with private individuals who have lots of experience or look for a company that specializes in hitches and towing. Love To Know Camping thanks Tim Casteen for taking the time to discuss share his expertise and advice in this interview about Avion Trailers, and wishes him great success in his future endeavors and travels.